September is the month of corn. Trucks are parked by the side of the road, heaped high with ears of sweet corn and signs saying ten for a dollar (otherwise known as “Please! Take it!”). Coworkers bring in bag- and boxfuls to work, in desperate hope that someone will be willing to deal with the overflow. When there is extra corn in the house, but I don’t really feel like eating it straight, spoonbread is a nice option. I’m not a big fan of fresh corn in cornbread, but spoonbread is more like an informal souffle with a bit of cornmeal in it. The version I like to make has both fresh sweet corn and roasted green chiles, as well as plenty of cheese, and the effect is rather like chile rellenos, with more of the fluffy coating and less of the chile. You get both a bit of crustiness and a rather pudding-like interior, and it makes a great accompaniment to roast chicken. 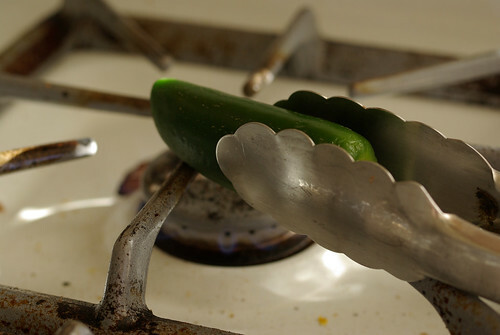 Ideally you should use anaheims, or other mild green chiles. Poblanos would be a great choice for a little more heat. On this occasion all I had were some big (and very hot) jalapeños, so I limited myself to two so the spoonbread wouldn’t be too fiery. You can either roast them in the oven (like I do with bell peppers) or toast them over an open flame with tongs. This is such an easy dish to put together, being very tolerant of adjustments, that it could easily be adapted to all sorts of flavorings and accompaniments. It could be made plain, with a sharp cheese, or flavored with anything you might put in a souffle or quiche: mushrooms, scallions, herbs, and so on. A bit of crumbled sausage or bacon might be really good, come to think of it. Minus the meat, it would make a great vegetarian main course, with plenty of greens alongside. 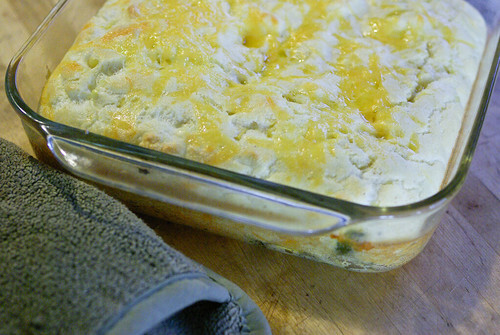 I may have to start making spoonbread other times besides corn season. Preheat the oven to 350°. Butter an 8 inch square baking dish with half of the butter. Roughly chop the chiles and spread them in the bottom of the baking dish. 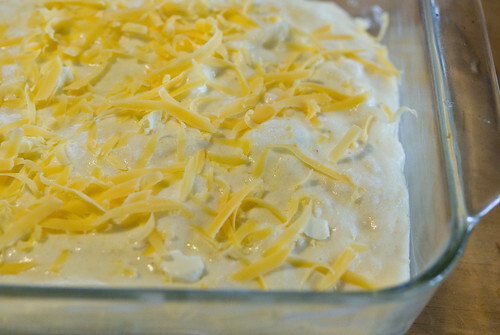 Scatter the grated cheese over them, reserving a small handful for the topping. 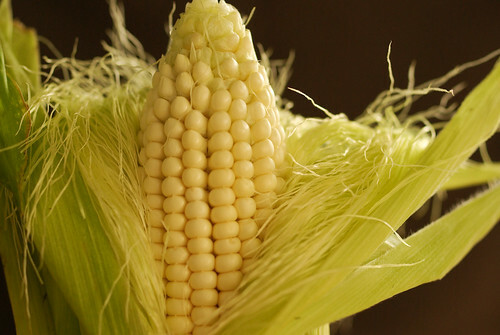 Cut the kernels off the ears and combine them with the yolks, cornmeal, flour, milk, sour cream and salt. Mix well, then gently fold the whites in. Pour it carefully into the pan with the chiles and cheese. 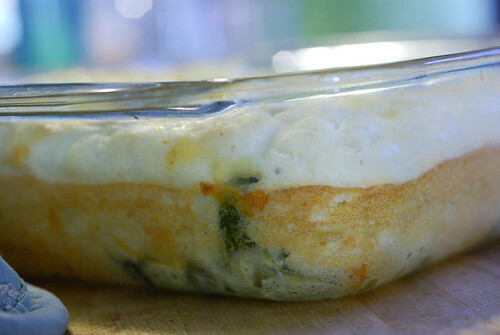 Scatter the reserved cheese on top and dot with the remaining butter. Bake for 25-30 minutes. Serve right away. maybe I wasn’t in a corn aware state of being the last couple of years, but this year’s availability of exceptionally sweet yellow goodness at every crossroad is amazing. I’ve had some chewy and tough ears but even those were very flavorful. An anomaly or have I been corn ignorant until recently? It’s pretty much always been that way in September, but this year seems to have produced particularly beautiful ears. Good pollination and nice hot weather. Even though at our house the corn bread by itself would be a meal, if it were colder outside and not headed for 85+ days this week, a nice pot of chili sounds great with this..and yes of course, an egg over easy.